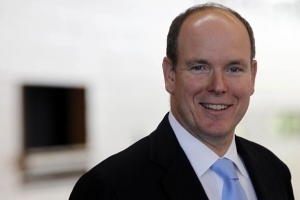 On Monday, December 2, 2013, His Serene Highness Prince Albert II of Monaco arrived at the Salon d’Honneur at the Galeries Nationales du Grand Palais in Paris, France to attend the private opening of the exhibition, Cartier: Le Style et l’Histoire, organized by the Réunion des Musées Nationaux-Grand Palais with the support of Vranken-Pommery Monopole. Guests attending the private gala opening included well-known French historian, journalist, and close friend of Prince Albert II of Monaco, Mr Stéphane Bern, British actress, Ms. Kristin Scott-Thomas, and Italian actress, Ms. Monica Bellucci, to name a few. “…has been designed as an art history exhibition. As works of art in their own right, the jeweler’s creations are shown in the context of changing usages and styles. The history of the house of Cartier from its foundation in 1847 until the 1970s is an opportunity to open the door to a laboratory of forms and enter into the workings of a sophisticated company which creates jewelry and accessories for their intrinsic beauty as well as for their social function. Six hundred pieces of jewelry, objects, watches and clocks are teamed up with dresses, coats and accessories, furniture, paintings, advertising photographs, engravings and fashion magazines to give visitors an idea of the art and taste of the time. The exhibition aims to put Cartier’s stylistic choices into perspective. Over 200 preparatory drawings, numerous archival documents (stock registers, book of ideas, drawings relating to the shop in the rue de la Paix, photographs, plaster casts…) take visitors behind the scenes. Cartier: Le Style et l’Histoire will be open to the public on December 4, 2013 – February 16, 2014. For more information about the exhibition please click here. To view photos from the opening please click the links below.